It seems that it was only yesterday when we blogged about the New Oakville Trafalgar Memorial Hospital being nearly ready, and it finally is! 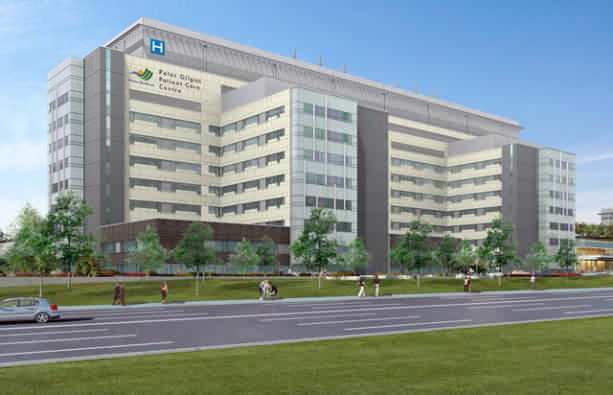 A few weeks ago, Halton Health Care opened the doors of their $2.7 billion facility to the public and everyone’s who’ve seen what’s inside the 1.6 million square foot facility can’t stop raving about the new hospital’s features. The new hospital is truly on a league of its own. It offers 450 in-patient beds and services ranging from maternal care, child care, mental health, dialysis, diabetes care, and emergency services. 80% of the rooms are single-patient rooms, thus making sure that cross-infection is kept to the smallest possible number. This also gives patients and families more privacy, making a person’s hospital more pleasant. For visitors and staff, the hospital’s cafeteria has 400 indoor and 60 outdoor seats. Parking is not a problem either, with 2,000 parking slots that’s available for use. Halton Healthcare CEO Denise Hardenne shares that the hospital was designed to take care of the community now and its possible health care needs in the future. She also shares that it took 10 years of planning, 4 years of construction, and 4 more months for training and orientation before the hospital was finally deemed ready to accommodate its first patients. The transfer of the 237 existing patients from the legacy hospital to the new one took 10 hours and about 280 physicians, staff, and volunteers. The legacy site at Reynolds Street is now closed and all services, including the emergency ones are now attended to at the new facility. Oakville Trafalgar Memorial Hospital (OTMH) features an automated pharmacy system that helps to ensure every medication gets to the right patient in time. The system can package two million doses of meds a year. Lots of laboratory tests needing to be done? The automated laboratory system can run 65 different tests simultaneously and be done with all 65 tests in just around 30 minutes. This means that the staff will know insights about the patients’ condition faster and act on what’s needed to be done faster as well. With an emergency department that’s designed for superb infection control and efficient patient management, OTMH is at the forefront of Canada’s healthcare. Because of its sheer size, navigating the 1.6 million square foot Oakville hospital seems to be a daunting task. The OTMH took care to add enhancements to the Halton Healthcare website to help visitors and Oakvillians find their way around the huge facility. The OTMH is located at 3001 Hospital Gate which is at Third Line and Dundas Street. The information needed to access the parking, maps, directions and transit to specific departments, services, or clinics can be found at the Halton Healthcare website and clicking the ‘New Oakville Hospital’ link around the top right corner of the main page. Step-by-step directions to access the hospital’s various areas is available via fact sheets and videos listed at the A-Z Index. Friendly volunteers and hospital staff can also help visitors when they visit the new OTMH. Want to make Oakville your home? Then contact us after taking a look at the best homes Oakville has to offer and finding one that interests you. With welcoming neighbourhoods and a strong sense of community spirit, you’ll have no trouble fitting right in at Oakville!